Oh hey everybody! 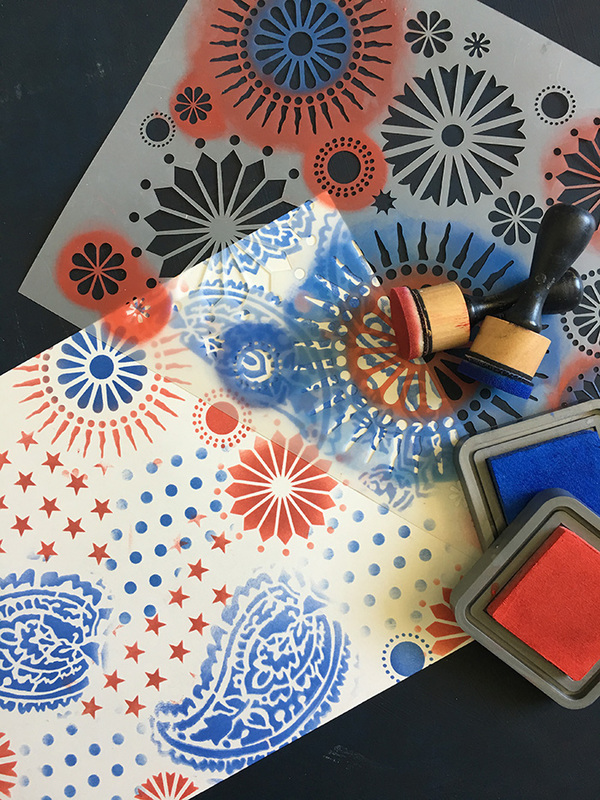 I’m Debi Adams and I am thrilled to be bringing you a new StencilGirl® column called "DIY." I love arts and crafts and everything in between. 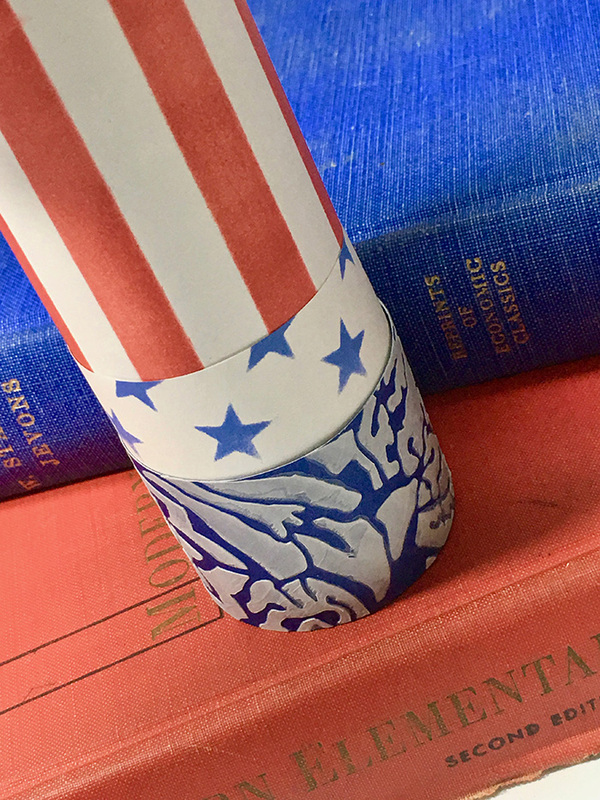 This column is truly a mish-mash of anything and everything that you can create with stencils. 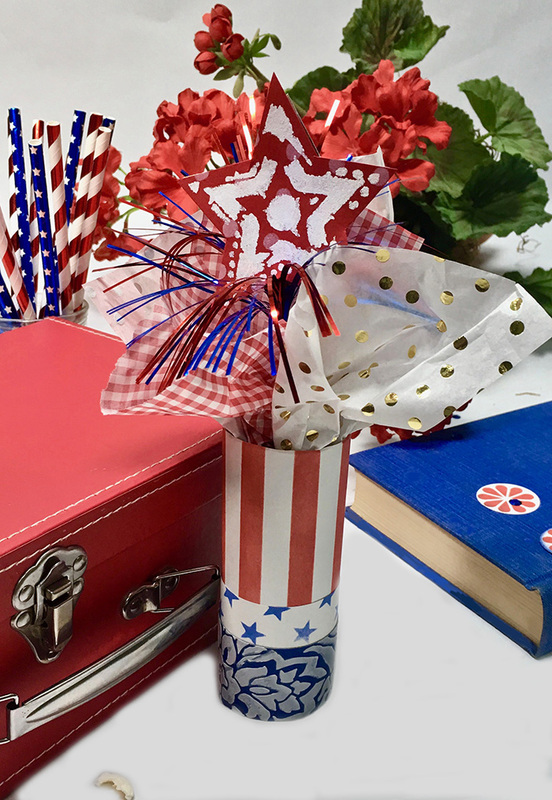 On a personal level, it’s a lot about party decor and gift giving more than anything else. I love pouring out my heart through creativity into something that has purpose and brings joy to others. No better place to demonstrate that than at a special celebration or unique gathering. 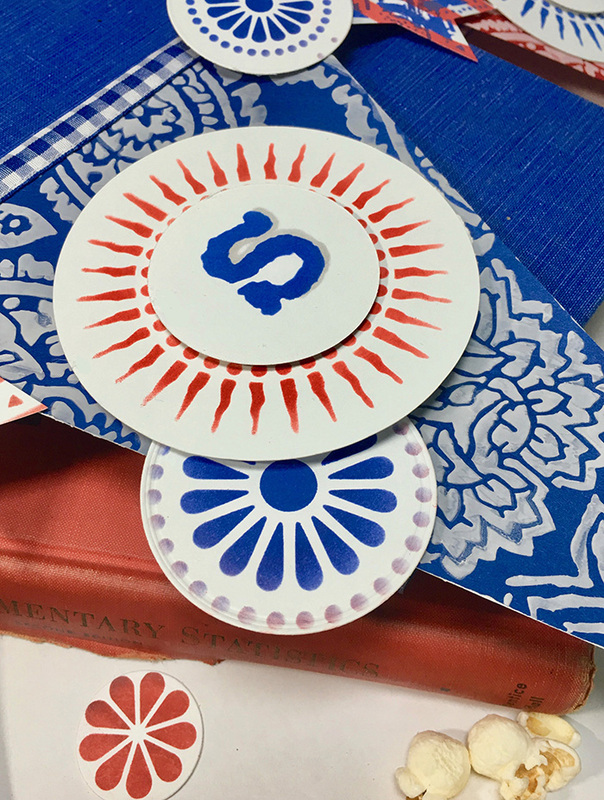 From cards to props, accessories to party favors, stencils can decorate nearly everything. With the Fourth of July arriving soon, I thought this would be the perfect opportunity to introduce several party pieces incorporating stencils that are quite easy to make. Although often used for mixed media and abstract art with lots of layering, stencils can also be used in their simplest form as seen here. When I throw a party, I always have a some sort of hanging banner with a sentiment, often times indicating the type of event. 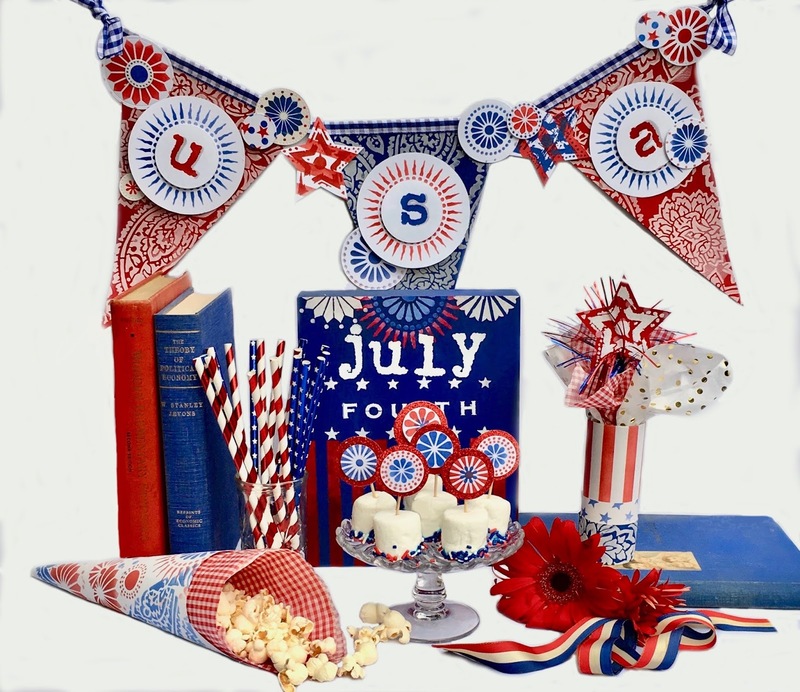 A banner is kind of like a giant greeting card and welcome mat combined! It also serves to bring the decor visually upward from the table(s) so that it fills the entire room with a festive flair. This particular banner was created by adding texture paste to Jessica Sporn's Paisley Floral Repeat stencil onto cardstock then cutting a pennant shape from the paper. I used ribbon to attach them together. 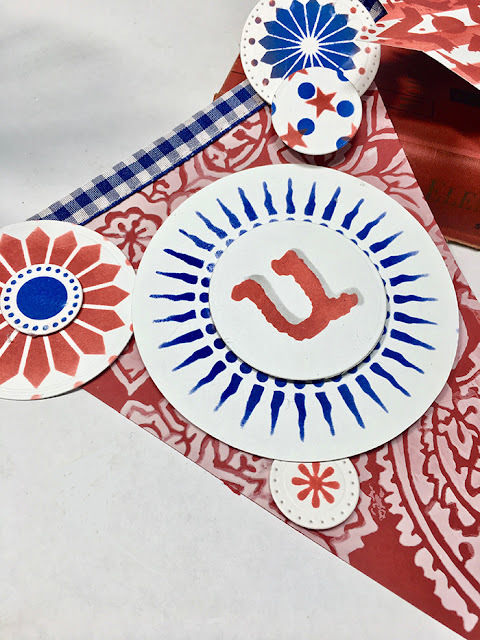 The letters and decor pieces were stenciled onto white cardstock circles (punched or die-cut) using blue and red ink and the stencils, Gingham Two-Step by Tammy Tutterow, Military Style Stars by June Pfaff Daley and Urban Insiders Star by Seth Apter. 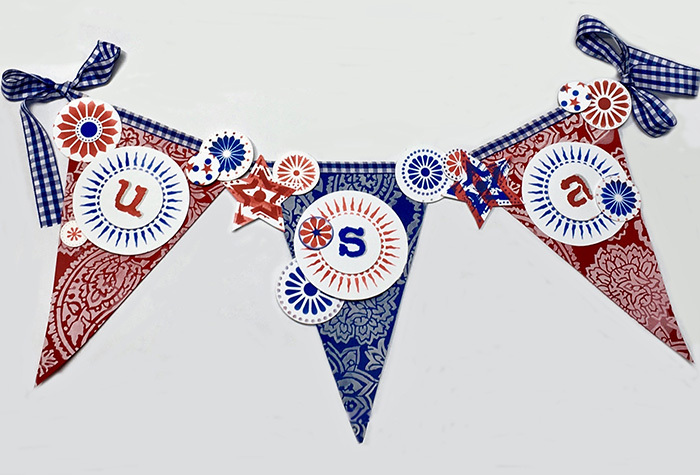 Sometimes I like to “fussy cut” a shape out and adhere it to the banner, as seen with the star. Adding foam dots to the banner creates dimension so it is definitely in my “go-to” art box. To make the letters, I inked the Vintage Typewriter Alphabet Stencil by Carolyn Dube onto circles cut from white cardstock and then gave them a dimensional look by using a gray marker on one side of the letters. You can never have to much "pretty" on desserts. They seem to be the finishing detail. 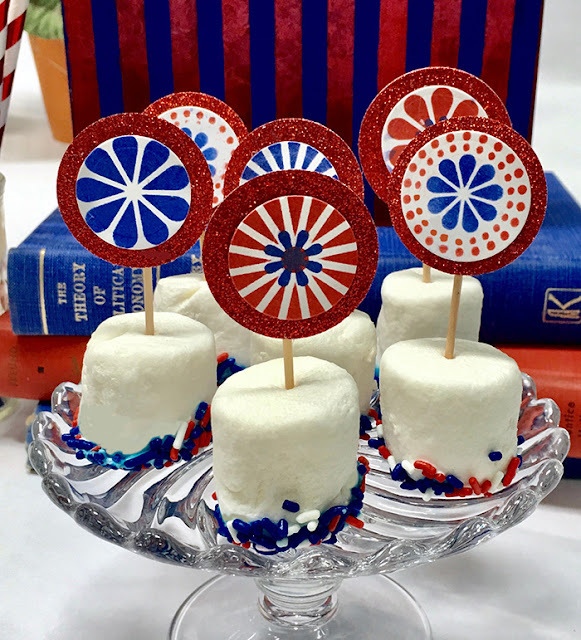 These dipped and sprinkled marshmallows were decorated using Michelle Ward's Circle 9 stencil onto a round piece of cardstock, adhered to a toothpick, and inserted into the marshmallow. 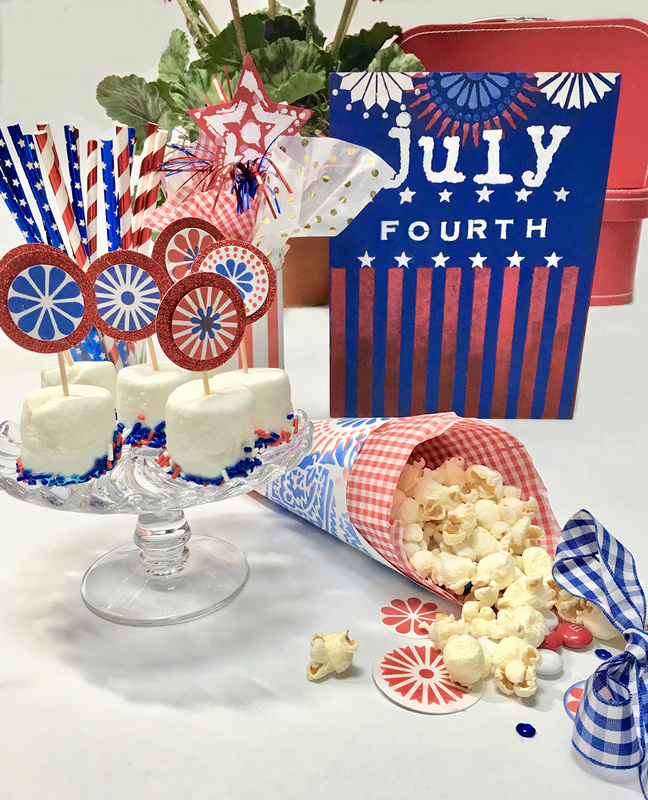 How fun, quick and festive! 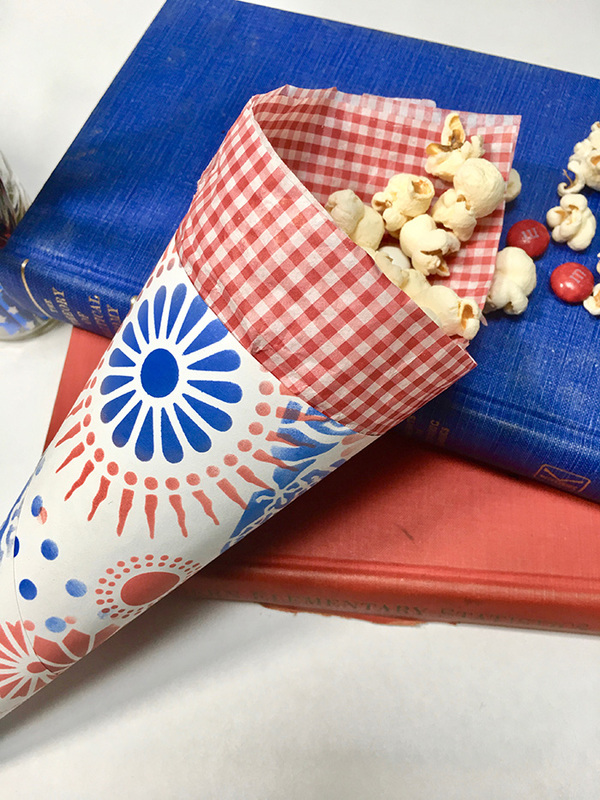 Stenciling on copy paper made these popcorn cones literally “pop”. So much cuter than just a bowl of popcorn on the table and better yet, they are self-serve. 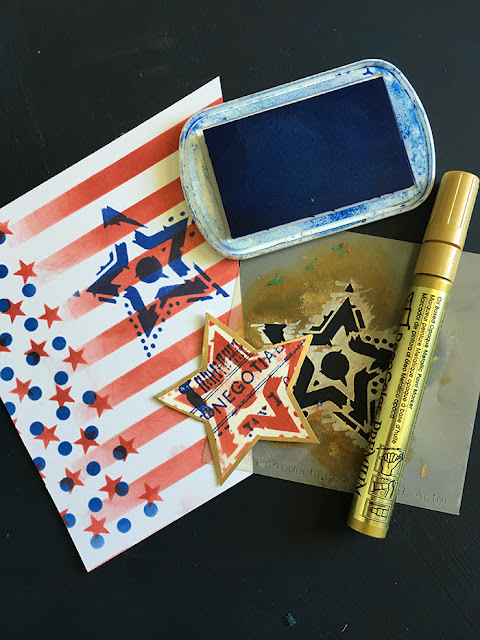 Again I used the Circle 9, Military Stars and Urban Outsider Star stencils but also included the Party Polka stencil by Tammy Tutterow. Firecrackers are a tradition for the Fourth and so they definitely needed to be a part of my decor. An empty toilet roll holder was the base for this party favor. It was covered with stenciled copy paper and left over remnants from the pennant. 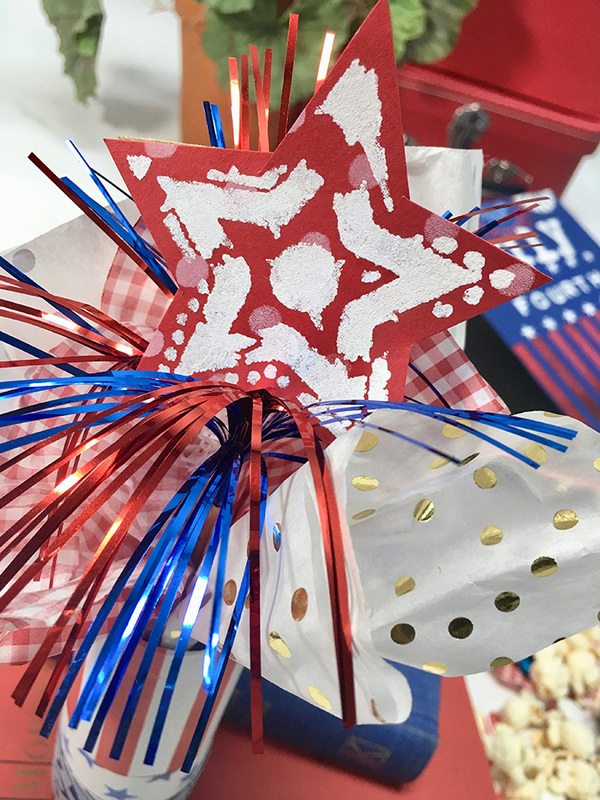 I wrapped the treat itself in tissue paper and stuffed it into the holder, added a metallic sparkler, and topped it off with another stenciled star. Colorful signage adds festivity to a table and carries out the theme. I purchased the wood base from the clearance section of a popular hobby store for $2.50! 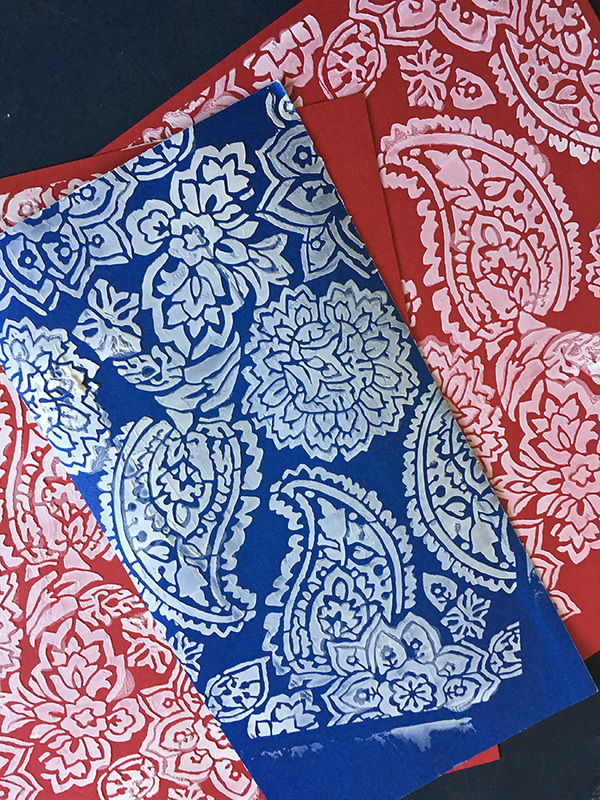 I repainted it and then stenciled the designs. Highlights on the stripes were created by adding a touch of white to the red paint base and stenciling only the top of the stripes, working down a bit until it blended with the darker red. Guess it looks like I got my 4th of July party already started. Now it’s time for some invites and a menu and I’m ready to go. Which project speaks to you? 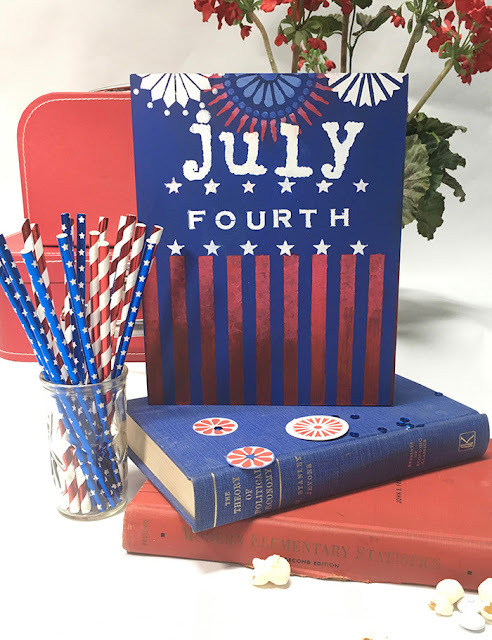 Got some special plans for the Fourth? Let’s get this party started! Thanks Karyl! 😊 I love a pretty party. What a terrific party spread, and clever use of stencils! 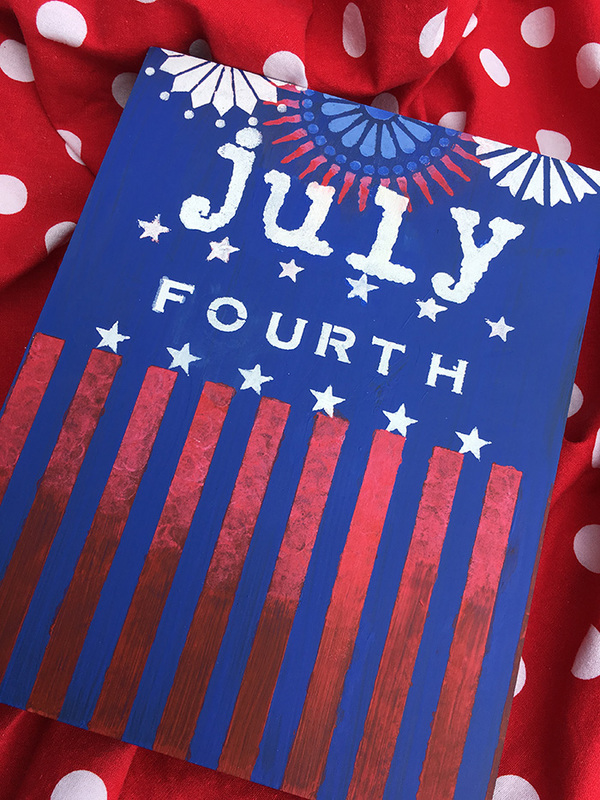 Thanks for sharing your artistic flair for the 4th!